I stumbled across this Australian site yesterday and found it a fascinating look at the overall campaign that we're painting soldiers for. 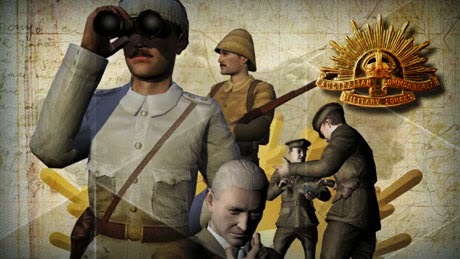 Gallipoli: The First Day is a 3D documentary website about the landing of the ANZACs on the Gallipoli peninsula on 25 April 1915. It is a collection of historical evidence, images, recollections, modern commentary and interactive graphic illustrations of the place and events of the Anzac landing at Gallipoli. It also outlines the main features of the campaign through to the Allied evacuations of December 1915 and January 1916. The 3D Map of the peninsula was built using topographic data taken from 1916 Turkish maps. Surveys of all the Gallipoli battlefields were made in 1916 by the Turkish Mapping Directorate under Brigadier General Mehmet Şevki Paşa and 43 maps were made. As the data is true to the period our 3D map doesn’t show contemporary building developments and roads. Sydney University Archaeology Department then supplied the GIS data used to shape and create the terrain topography. This map is particularly useful to explore the rugged ground that the Turks and ANZACs fought over. Melbourne based sound designer and composer Roberto Salvatore recorded authentic artillery preserved by Fort Queenscliff Museum in Victoria to create a dramatic backdrop against which the story is told by acclaimed Australian actress Lucy Bell. Throughout the landscape, other voices permeate: that of those who were there. The men who survived the horrifying slaughter of the first day record the events they experienced in diaries, and letters. They are respectfully given voice by a cast of talented actors, including one of Australia’s finest, Hugo Weaving.